Hot & Spicy BBQ Sauce. This is a robust All-Natural BBQ Sauce. When we finished our Original BBQ Sauce - the first question someone asked is, "Now how about a hotter version of the Original?" 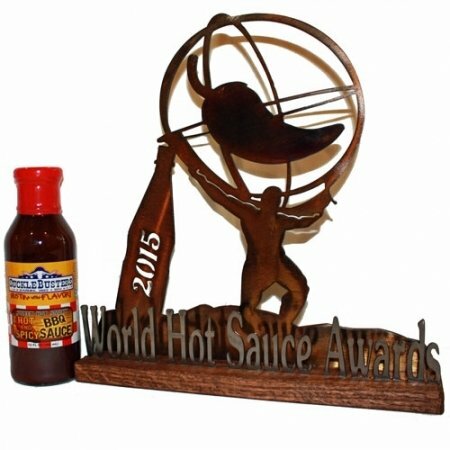 This is it and it's everything our award winning Original BBQ Sauce is plus chipotles for more heat. It has a sweet-hot-smoky flavor and medium amount of heat provided by the chipotles. Its not over powering, but compliments the smoky flavor of BBQ with a nice kick! Baste it on the last few minutes of cooking as a finishing glaze OR pour it on just before serving. Either way - it's sure to please. Ingredients: Vinegar, Water, Brown Sugar, Tomato Paste, Cane Sugar, Chipotle Pepper, Spices & Xanthan Gum. NO MSG.